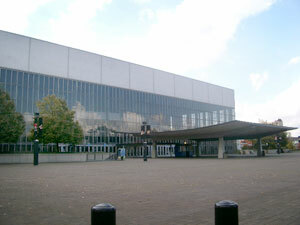 Portland’s Memorial Coliseum opened on November 3, 1960. But it was on January 8, 1961 that it was formally dedicated to the memory of Portland’s war dead. realization of a plan to put here something of enduring nature in memory of Portlanders who fought in World War I, World War II, Korea and the Spanish-American War. there would never be another world war and that no names would have to be added to those of the more than 1,600 men and women who died in military service and are listed in the honor roll book in the Memorial Chapel of the coliseum. On January 5, 2011 the city council re-christened the Memorial Coliseum the Veterans Memorial Coliseum, to recognize more fully that the Coliseum was built to honor veterans in the Portland area.